I am afraid that Aeolus didn't show up a lot the last few weeks. The wind was weak and often blowing from the east, which is not the kind of weather we are looking for. There was no need to set up any sand catchers or saltation sensors, but we still had some instruments that could prove themselves useful. There might be little wind, but that's good enough for our sonic anemometers! These instruments measure the wind direction and velocity by using sound. Sonic pulses travel between a pair of transducers and the time it takes to get from one to the other is used to determine wind speed. The wind - and therefore sand transport - can get affected by the local topography; in this case, the dunes. It's possible for the wind to change direction when it hits a 'wall' like that, or create vortexes when it flows over it. If the wind changes direction, then the transported sand will do that too, which is why we want to know the details of this phenomena. ... Until the 21st of October. That day came with we were hoping for. Finally, we had wind! This was the first time all our aeolian transport equipment was set up on the beach; seventeen vanes with sand catchers and four frames with saltation sensors - quite an impressive sight! We even had to pay attention to where we put your feet, since we didn't want to disturb the beach too much. Leaving footprints can affect the sediment transport, so walking in front of our instruments was an absolute no-go! Setting up all these instruments took place in the morning, but the wind was already strong at that time. The transported sand is dryer and therefore lighter of colour than the moist sand it travels over, and it creates a pattern on the beach that is similar to the one that can be found on a zebra. The beach was covered with these sand strips. This was all very wonderful, until the weather threw a spanner in the works later that day. It started to rain; not so hard that it would stop sediment transport, but it was enough to clog up our instruments. It was very frustrating to see all this sand travelling over the beach, but not having the means to measure it. We hoped that the next day would bring us less rain, and that we could do some proper measurements. Part of our prayers was heard; there was no rain! But also no wind, or at least not as strong as it was the day before. Do you have any suggestions or questions? You can send an e-mail to aeolex2015 [at] gmail.com. 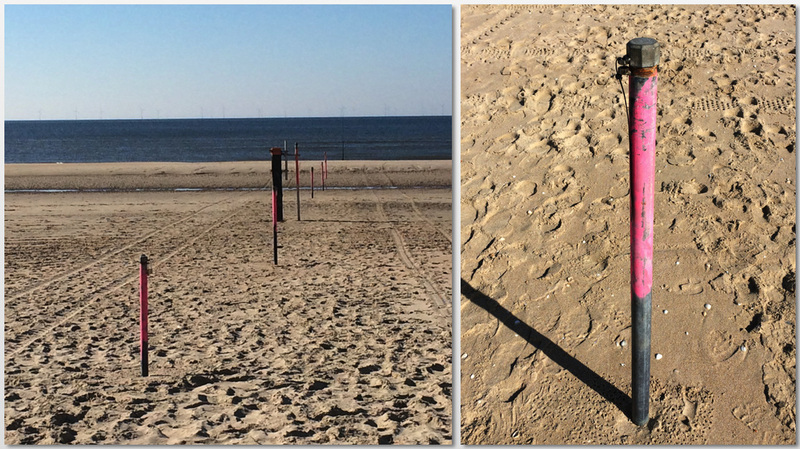 Our last blog was about the soil moisture characteristics of the beach. Besides our measurements for the soil moisture characteristics we have been preparing the aeolian equipment and ourselves for windy days with aeolian sand transport. At first this did not seem to happen, but wednesday 7 October was our lucky day! So today's blog post is about measuring aeolian sand transport. The conditions required for aeolian sand transport on the beach are very specific. Besides a wind power of about 4 to 5 or higher on the scale of Beaufort, the wind angle, tide (beach width) and the soil moisture content do play a role as well. The beach of our field site is quite a narrow beach and therefore the extent of the fetch, the length on the beach surface over which the wind blows, is determined by the tide and the wind angle. In other words, during low tide the beach is relatively wide and thus it is more likely for wind transport to occur. Adding winds from the NW to N or SW to S results in a large fetch and a high potential for sediment transport. On wednesday 7 October we arrived at the beach at 7:30 in the morning, just after dark. At this time there was no transport (yet) so we had some time to setup our measuring equipment. To measure the amount of sand transport, we use the Modified Wilson and Cooke sediment catchers. These instruments are just poles containing a wind vane and a set of plastic bottles. The wind vane ensures that the opening of the plastic bottles (which catch the sand) is directed towards the wind direction. So we first set up the poles and when the transport started we added the plastic bottles. The bottles were replaced every hour to measure the amount of transport in 1 hour. Unfortunately due to some small rain events we had to remove some of the bottles during the measuring period to prevent clogging of the inlet tubes. In addition to the sand catchers, we also measured sediment transport on small timescales (seconds). Here fore we use home-built saltation sensors which measure the intensity of saltation. We arrived home after a fieldwork day of almost 11 hours. We were tired and hungry because we were running around at the beach all day. But.... we got some data! The day after the event we stayed home to weigh and clean all the bottles with sand (270 in total) so we are prepared for the next wind event! ​Unfortunately the event of wednesday 7 October was the only main event we could measure in the past 3 weeks because the wind was most of the time coming from the east. During this condition the dunes act as a kind of wind shield reducing wind speeds and thus aeolian transport on the beach as well. Additionally, if the wind is strong enough to transport sand in westerly direction, the transport does not contribute to dune growth. The video below shows the installation of the sand catcher equipment. On the beach you can see some small snake-like sand transport features which are called streamers. To understand wind-blown sand transport on a beach, it is necessary to study the wind processes (speed and direction) and of course how much sand is transported, but what people sometimes forget is that the hydrological processes are important as well. Especially on a beach! The higher the amount of soil moisture, the lower the amount of sand transport will be. To fully understand the soil moisture dynamics on a beach; groundwater fluctuations, the tide and meteorological processes are measured. In March of this year we already did a pilot, but now it’s the real deal, so everything had to be perfect. Instead of 8 groundwater wells, we now have 10 groundwater wells. The pressure sensor to measure the tide is now sitting closer to the shore line, since in March we couldn’t reach it anymore. We have extra soil moisture sensors which are measuring in the vertical direction at 6 depths (10 cm, 20 cm, 30 cm, 40 cm, 60 cm and 100 cm). 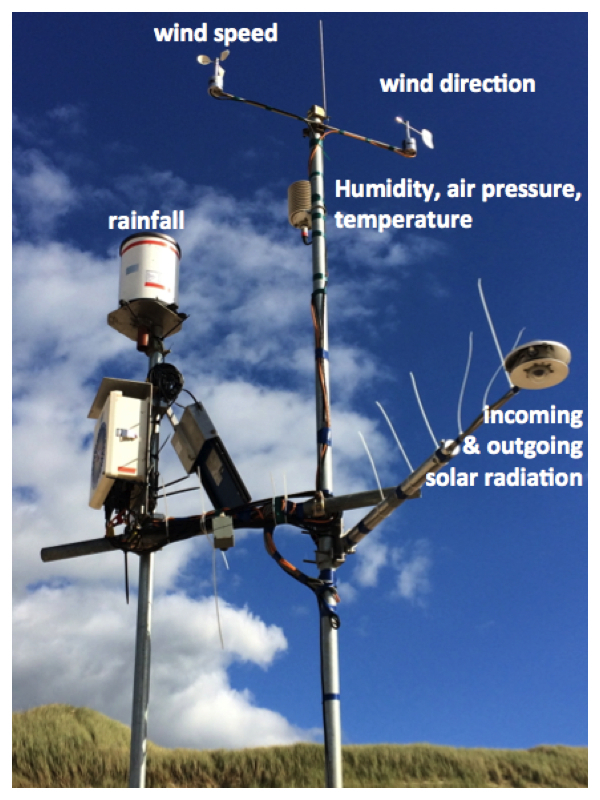 The weather station is still the same, which includes a temperature sensor, humidity sensor, radiation sensor, tipping bucket (to measure rainfall) and wind sensors (for wind speed and wind direction). With all these sensors I can study the influence of the tidal cycle on the groundwater movement, and the influence of the groundwater movement on the soil moisture content at the surface. Also the consequences of evaporation and rainfall to soil moisture can be studied. Imagine this, when the tide rises, the groundwater level will rise as well and will reach closer to the soil surface and thus soil moisture will rise too. Evaporation causes soil moisture to lower and of course rainfall does it the other way around. All of this is measured to understand how the Dutch dunes can grow with sea level rise. Our dunes can grow due to sand transport by wind. Wind speed and wind direction are important factors in this process. The width of the beach is of great importance as well. A wider beach increases sand transport but also remember: the higher the soil moisture content, the lower the amount of sand transport by wind processes will be. Soil moisture behaves like a glue that holds the sand grains together, which makes it harder for the wind to transport the sand. My colleagues (Winnie and Pam) are studying the beach width with pictures of the Argus Tower, the wind processes and how much sand is actually transported by it. I am studying the soil moisture content at the beach and in the end a model will come out of it, which hopefully will predict how much the dunes will grow over the coming ±10 years. Another colleague of mine, Jasper, will combine the results of Winnie, Pam and me and will put this model together. To make this expedition a bit more easier than the pilot in March we now got ourselves a big yellow sea container where we can store all of our devices. Fancy, isn’t it?! Our technicians did a great job by helping us building up the field site and arranging the sea container. Also new informations signs are located at our field site. So people can read what we are doing and won’t ask us all the time. Although, I like explaining it.. It makes life a bit easier and the wonderful weather is helping too! Until now I have a lot of groundwater data, since the groundwater sensors register the groundwater height each minute. Also the tide is measured every 1/10 seconds and the meteorological parameters are also measured each 5 minutes. Soil moisture is measured by hand, which in the beginning looks like fun, but after two weeks it’s probably one of the most boring jobs you can imagine. But when the results are satisfying, which until now they are, it will help you continue to do these boring measurements. The dataset is getting bigger every day. 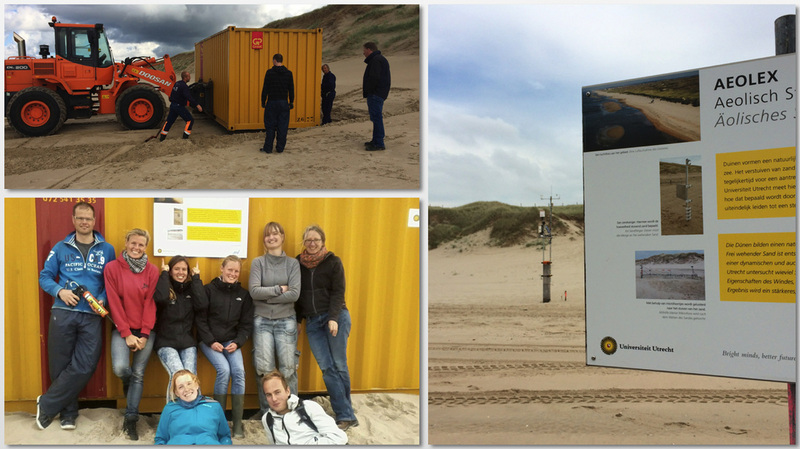 On the 22nd and 23rd of September the field experiment Aeolex 2015 started with the deployment of the permanent measurement devices and the placement of a shipping container. After the container was placed we started building the cross-shore array of groundwater wells. This required the creation of deep wells in the beach, for which the technical team has created a special drill (see photo). At the seaward side of the array of ground water wells a pressure sensor was positioned in the sea. It was close to neap tide; to ensure the sensor remains submerged during low water at spring tide also the sensor was placed deep in the sea (see movie). This was a serious test for our raingear. The jacked of Technician Chris failed this test. More shoreward in the array, a weather station was mounted on top of one of a beach pole (see photo). 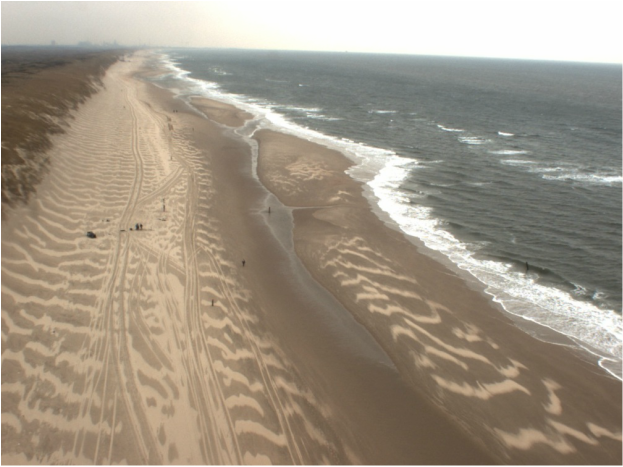 The field location, as seen from the Argus video system, The sand stripes on the beach indicate aeolian activity. 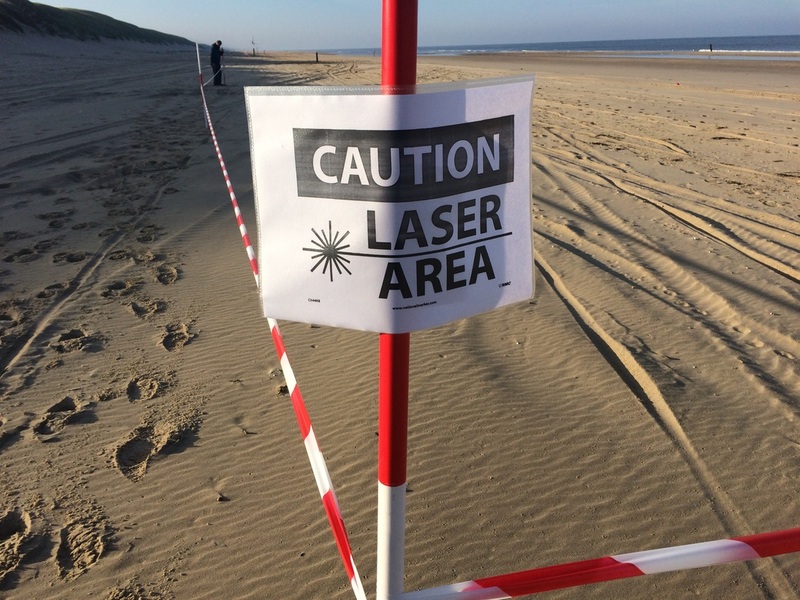 From September 22 until the end of October, the coastal research group of Utrecht university is organising the Aeolex field campaign on the beach south of Egmond aan Zee. The goal of Aeolex, which stands AEOLian beach EXperiment, is to collect data on aeolian (wind driven) sediment transport on the beach. Aeolian transport and the factors influencing this transport such as hydrology, morhpodynamics and meteorology are investigated during the campaign. The field site has been a study site of Utrecht University for many years. These historical records allow us to upscale the measurements obtained during the field experiment. In the next weeks you will meet the researchers, get acquainted with their research and how their research helps us to get a better understanding of our dynamic beaches dune system.